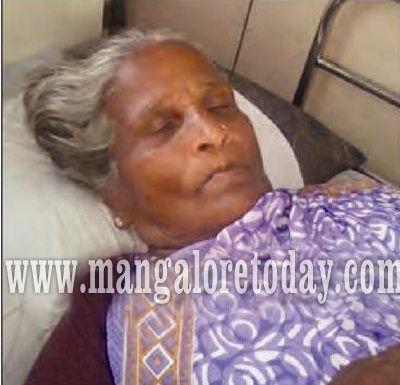 Mangalore, Nov 5,2016 : An elderly woman named Shantha Devadiga from Pakshikere near Kinnigoli has lodged a complaint with the Mulki police alleging that a gang backed by Zilla Panchayat Vice President and some elected representatives of local panchayats had attacked her over a trivial issue. The woman is now hospitalised. According to the complainant, ZP Vice President Kasturi Panja, Kemral Gram Panchayat President, Nagesh and Taluk Panchayat Member Vajrakshi Shetty, Sudhaker Shetty and Sheshappa had entered the poultry farm run by Shantha’s specially abled son Bhojaraj, along with some goonda elements and had threatened the mother and son. They had even attacked the elderly woman. It is said though Bhojaraj had obtained no objection to the setting up of his farm by neighbours and also had a licence from the Panchayat, some people had complained against the farm with the Kemral Gram Panchayat. Some people behave merciless and lack respect and basic etiquette too. On what terms did he win the elections ? Is it because of rowdyism? Hedigala Kelasa , Whatever its not right assaulting a woman? Give respect and take respect. Will you assault your mother? This is an illegal act , take action on the ZP President. First of all assaulting is a crime.